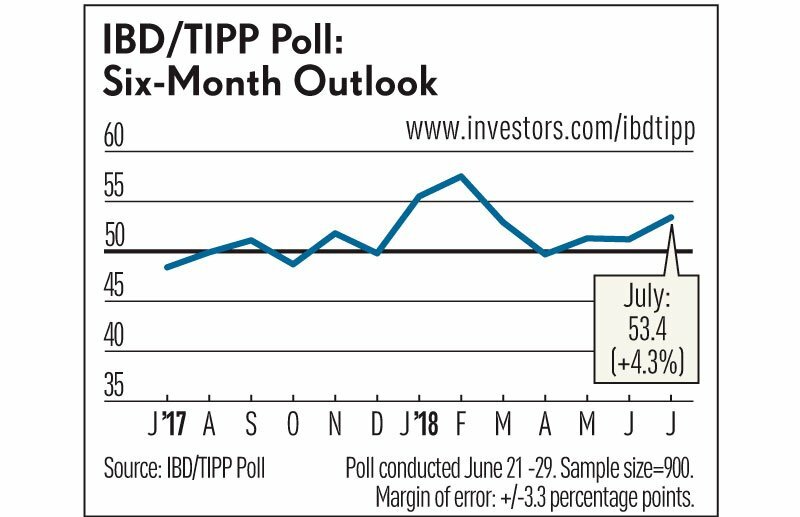 The monthly IBD/TIPP Economic Optimism Index, a collaboration of Investor’s Business Daily and TechnoMetrica, gauges how confident consumers, workers and investors are in the pace and direction of the U.S. economy. As with all of IBD/TIPP’s proprietary monthly indexes, a reading above 50 signals optimism, below 50 pessimism. 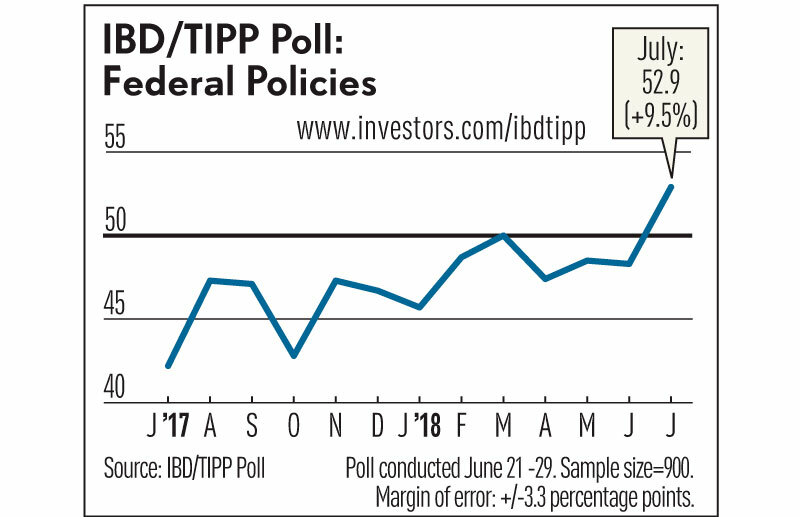 The IBD/TIPP Economic Optimism Index is made up of three subindexes, including one for the respondent’s outlook six months into the future, the respondent’s personal financial outlook, and how the respondent views current federal policies. The goal each month is to give as accurate a reading of the current state of the economy as possible. The average for the index over the past 17 years has been 49.4, or slightly pessimistic. The index high of 62.9 was reached in March of 2002, six months after the 9/11 attacks, as Americans rallied behind the U.S. response to the terrorist attacks and confidence grew that the post-9/11 economy would not go into recession as widely feared. The index bottomed in August 2011 at 35.8, as the economy struggled to emerge from the financial crisis and key initiatives to boost economic growth had yet to have an impact. IBD/TIPP also produces the Presidential Leadership Index at the beginning of each month. See the schedule of upcoming IBD/TIPP poll releases. 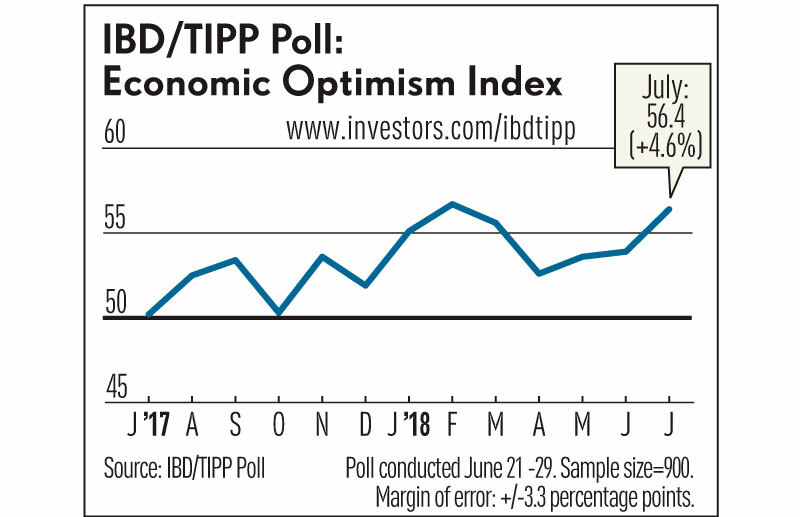 The IBD/TIPP Economic Optimism Index saw a sharp 4.6% gain to 56.4 in July. This is the third straight gain for the index, and the second highest it’s been since October 2004. It also marks the 22nd straight month that Economic Optimism Index has been over 50 — which signals overall optimism about the economy — a record run for this index. It is also well above its long-term average of 49.4. The index stood at 44.4 in December 2007, the month that the U.S. officially entered a recession. The Six-Month Outlook is a forward-looking gauge that looks at how consumers feel about the economy’s prospects over the next half year. The index climbed 4.3% to 53.4. in July. The volatile gauge surged 11.4% in January, and then bounced up and down for several months. The reading for this index remains in optimistic territory and well above its long-term average of 46.3. This index stood at 32.1 in December 2007, the month the economy fell into recession. The gauge of how Americans feel about their own finances in the next six months rose another 1.1% in July to 62.8, which marks the third straight monthly increase. The index’s all-time high of 65.3 was set in January 2004, when the Bush-era tax cuts began to kick in. It jumped this January, the month President Trump’s tax cuts went into effect. 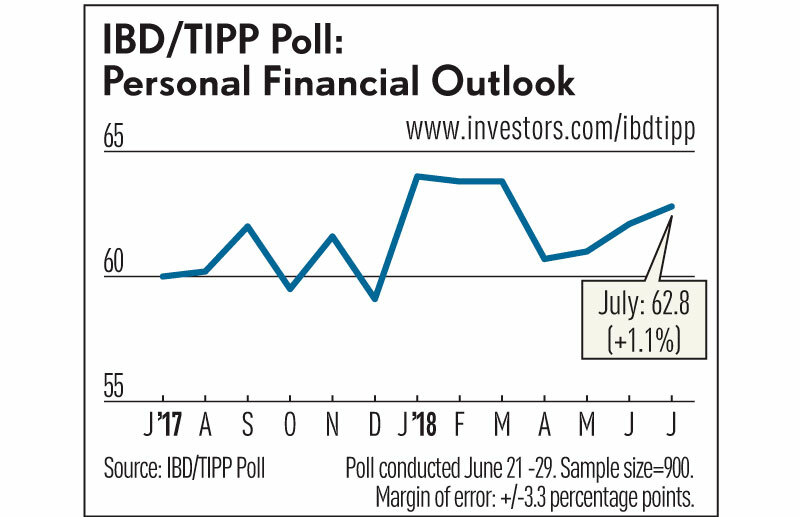 The Personal Financial Outlook is the most consistently optimistic index in the IBD/TIPP data set. It remains above its long-term average of 57.1. A measure of Americans’ confidence in government, the Federal Policies component shot up nearly 10%, from 48.3 in June to 52.9 in July. That’s the highest it’s been in nearly 12 years and well above its 17-year average of 44.8. This index briefly moved into optimistic territory in February 2017 for the first time in 10 years, and in March of this year returned to that feel-good zone. Intended to gauge how Americans view government policies put in place by the president, Congress, the courts and the Federal Reserve, the Federal Policies Index has consistently been the least optimistic of the three subindexes that make up the Economic Optimism Index.